A portfolio of stock photos of Mt. McKinley. 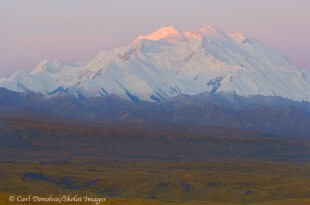 See my stock photo section of the website for a complete array of Denali National Park Photos. Mount McKinley, or “Denali” as it’s known locally, is located in Alaska’s Denali National Park and Preserve, and stands 20 320′ high, the tallest mountain in the United States. 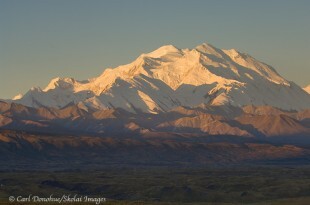 In fact, Mount McKinley is the highest mountain in North America. 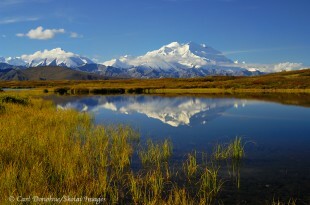 Measured base to peak, Mount McKinley is the tallest peak on land, at between 17 000′ and 19 000′ of vertical prominence. 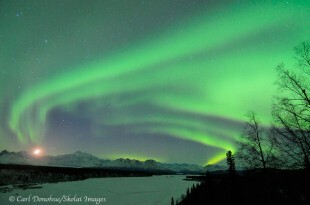 This portfolio of photos includes photos of the Aurora borealis over Mount McKinley, Denali by sunrise, as well as images of the summit and hikers and backpackers nea Mount McKinley. Panoramic photo of the Alaska Range and Mt. McKinley. A panoramic image, 5 horizontal frames stitched together, of the Alaska Range and Mt. 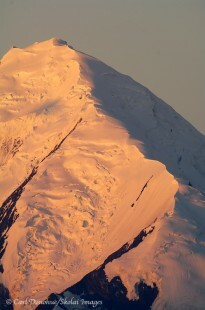 McKinley, or Denali as it’s commonly referred to, glowing in the early morning alpenglow of a fall sunrise. A full moon sets in the distance. The peak, or summit of “Denali”, or Mt. 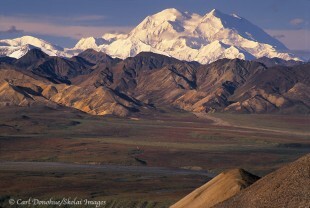 McKinley, is over 20 000 feet above sea level, and this mountain is the highest mountain in North America. Denali National Park, Alaska. 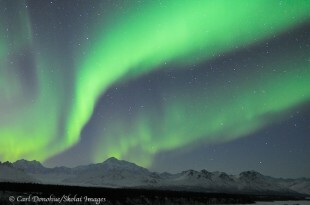 The aurora borealis and Mount McKinley. 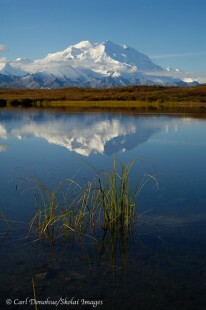 The Alaska Range, and Denali, reflections in a pond. The summit of Denali, Denali National Park, Alaska. Dawn alpenglow on Mt. 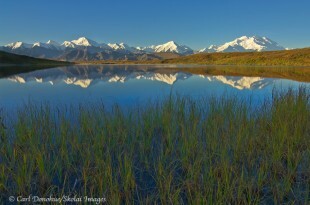 McKinley, Denali National Park, Alaska. Denali photo, Mt. McKinley, Denali National Park, Alaska. 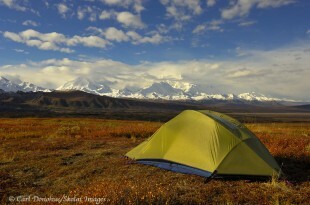 A tentsite, backcountry camping in Denali National Park, Alaska. Denali, Or Mt. McKinley, Denali National Park, Alaska. Mt. McKinley summit, Denali National Park, Alaska. 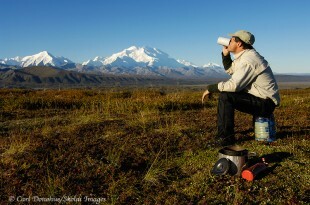 A backpacker and Mount McKInley, Denali National Park, Alaska. 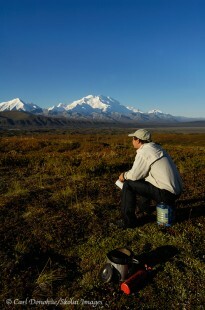 Hiking in Denali National Park, with Mount McKinley in the background. North face, Denali, Denali National Park, Alaska. Backpacking, near Mt. McKinley, Denali National Park, Alaska. Backpacking camping near Mt. 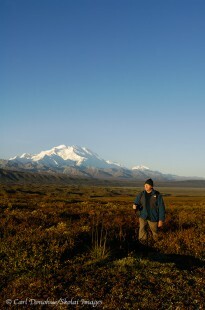 McKinley in Denali National Park, Alaska. 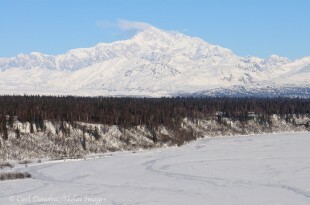 Denali photo, the mountain, DenalI National Park, Alaska. Mt. 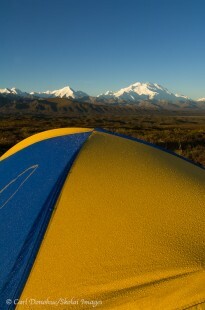 McKinley south peak photo, from Denali State Park, Alaska. 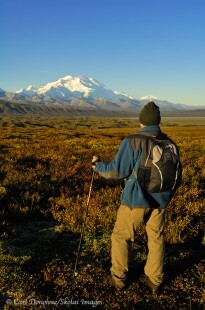 Hiking near Mount McKinley, in Denali National Park, Alaska. The North Peak of Mt. McKinley, Denali National Park, Alaska. 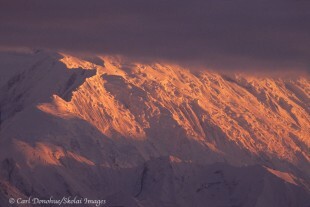 Dawn alpenglow on Mount McKinley, DenalI National Park Alaska. To inquire about purchasing any of these images, contact me. 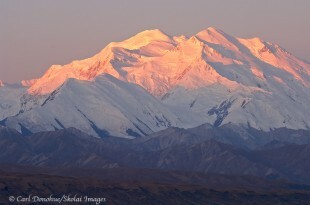 First summited in 1913, today Mount McKinley is climbed regularly. Extreme temperatures, as low as -75degrees F have been recorded on the mountain, with amazing wind chills at minus 120 degF. One experiment recorded temperatures as low as minus 100 degrees F. That makes for some gnarly climbing! Officially, outside of Alaska, the mountain is named “Mount McKinley”, after US ex-President William McKinley, from Ohio. 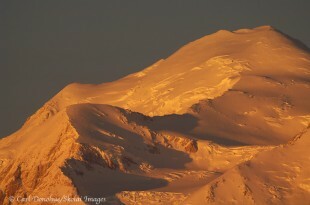 The state of Alaska changed the name back to its traditional and native name, “Denali”, through the Alaska Board of Geographic Names, however the federal government, of Board of Geographic Names, has so far denied requests by the Alaska legislature to change the name, so Mount McKinley remains the name outside its home state. 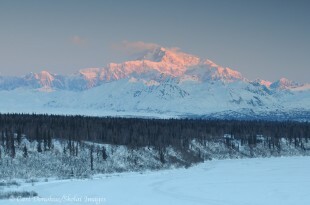 Most Alaskans refer to the mountain as Mount McKinley. The North Summit is the highest of the peaks. 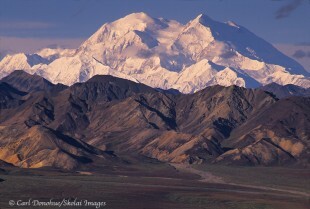 Mount McKinley is part of the massive mountain chain that run through the heart of Alaska, the Alaska Range. 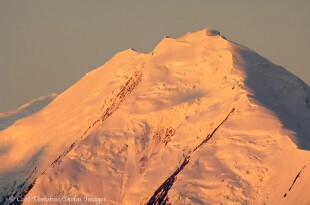 nearby, Mount McKinley’s sister peak, Mount Foraker,stands almost as tap at 17 400′ high, the 3rd highest peak in the United States. 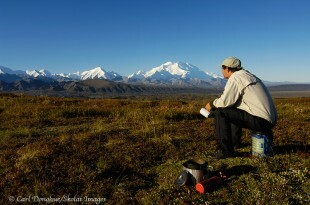 On a clear day, Mount McKinley can be seen as far as Anchorage, nearly 240 miles to the south. 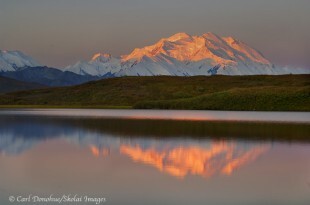 Mount McKinley is the centerpiece of Denali National Park and Preserve, perhaps all of Alaska. The mountain draws tourists from all over the world every year, to climb and to photograph and view it; but the sheer size of the mountain makes that difficult, as it creates unpredictable and rugged weather patterns. It’s estimated that as few as 20% of the visitors to the park actually get to view the mountain.